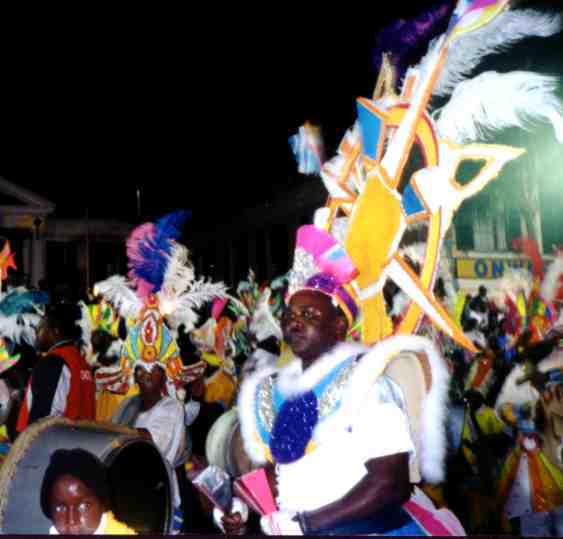 A unique multimedia e-book on Junkanoo for the young and the ever-culturally young at heart. Available as download by pdf, rtf, disk, and html - $6.99 through the secure PayPal site. For an online literary sample of SELAH, PAPA LOU2, AND JUNKANOO,scroll down to the end of this page. 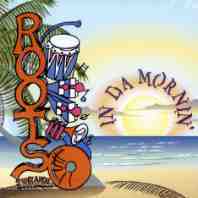 ROOTS IN DA MORNIN' CD - $ 15.00; Tape - $ 10.00. TRIBUTE CD - $15.00; Tape - $ 10.00. With its pleasing blend of intense, ancestral sounds from the goombay drums to the conchshells, Junkanoo music has to be among the most powerful in the world. Truly, there is nothing like an in-the-flesh Junkanoo experience, but the next best thing is being the possessor of Junka music that you can enjoy when and where you are culturally inclined. A top-ranking Junkanoo group, ROOTS has distinguished itself by becoming the first group to produce a valued collection of Junkanoo music, both secular and sacred. The rhythmical movement of the talented masses of Junkanooers is called "rushin'"; You, too, will experience an energizing adrenaline rush as you experience this music, a rare find among musical collection in the States. In ROOTS IN DA MORNIN', you have pure, powerful Junka rhythms; in TRIBUTE, you have sacred music with a Spirit-stimulating "Joyful Noise" (one of the cuts) beat. The ROOTS leaders, members, and especially the group's musical director, Chris Justilien, are to be commended for a masterful, musical job. As the kids would say, ROOTS has truly "got it goin' on!" And as the tape insert states, "...the music, both mesmerizing and irresistible--expresses the soul and energy of the Bahamian people." THIS MAN CAN COOK! 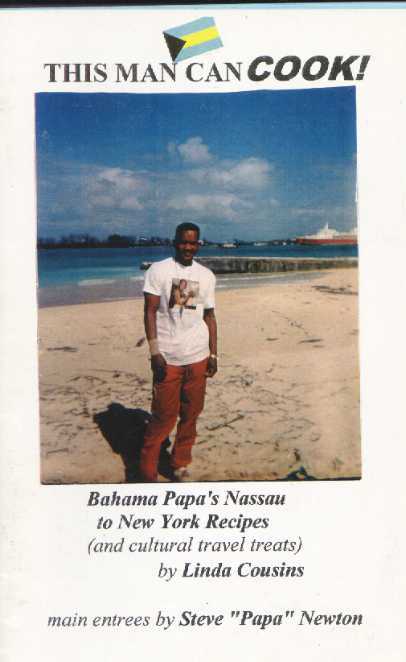 - Bahama Papa's Nassau to New York Recipes (and cultural travel treats) - Linda Cousins with main entrees by Steve "Papa" Newton. $ 5.00. Don't know which I love more--the spirit of Junkanoo or that delicious Bahamian cuisine. Got the best of both worlds with my fiance, dedicated Junkanoo performer, Steve "Papa" Newton, who is also a great Bahamian cook. This work pairs the cultural joys of Junkanoo, (including the lively "Junkanoo Man" poem), with some terrifically tasty Bahamian recipes. There's also a taste of the drumming and dancing in Brooklyn's Congo Square and some Tennessee treats to follow the Bahamian entrees. U. S. residents: Add $ 2.50 postage/handling, with the exception of the Moods of the Sea poem and ROOTS CD'S and tapes, which call for postage of $ 1.50; add $1.00 for each extra item ordered. 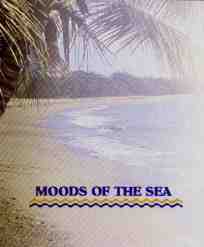 International residents, add $ 5.00 for initial order, $ 2.00 for Moods of the Sea, as well as CDs and tapes; $ 1.50 for each extra item. If also ordering items from the Cultural Traveler Soulshop, please combine total amount in one payment. Published by Linda Cousins-Newton, Director, Ancestral Pro-Motions, 593 Vanderbilt Avenue--#189, Brooklyn, NY 11238-3512, USA. Akan@aol.com Copyright � L. Cousins 2002. All rights reserved. 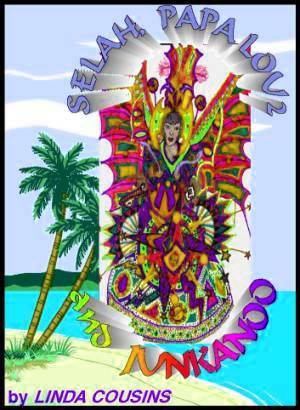 Artwork, "Junkanoo Queen", copyright (c) 2001 by talented Brooklyn teen poet and visual artist, Rakeiya Herdigein. All rights reserved. No part of this publication may be reproduced, stored in a retrieval system, or transmitted in any form or by any means, electronic, mechanical, recording or otherwise, without the prior written permission of the author. Dedicated to Steve "Papa Lou" Newton, veteran Valley Boy, who introduced me to what I call the "joys of Junkanoo." To the wonderful Bethel and Newton descendants who rendered so much warm Bahamian hospitality during my many jaunts to Junkanoo. To Chris Justilien, Junkanoo music master and fantastic Leader of Colours Junkanoo Group, Nassau, Bahamas; to Sam "Marathon Man" Williams, a great Bahamian patriot who has lovingly and lengthily served his people through the Bahamas Loving Care Association. To Beth of Vacation TravelMart who efficiently arranged so many of my cultural getaways to Nassau; to Monique of the Junkanoo Beach Holiday Inn Hotel who remembers my many visits well, rendering a welcoming smile and great service whenever I return; to Ms. Ethlyn of the housekeeping staff there who provides for my room needs in a timely, kindly fashion; to Lynda, who showed me that she wisely appreciates the motivational literature of our sisters; to Viola, who kept me well-entertained during our early morning Junkanoo walk, and particularly to those creative ancestors who brought the Junkanoo Spirit to this hemisphere and kept it going, kept it culturally flowing to and through today's rhythmically powerful brother and sister Junkanoos. Story Summary Ten-year-old Selah Parker and her Moms, Nia, and Baba, Kwasi are visiting Nassau, Bahamas, during the holiday season. Although Selah is having a "fantabulous" time, as she calls it touring the Bahamas and enjoying the beach, she is slightly bored because she misses her best friend, Ginger, her kitten, Cuddles, and her new drumset. She wants to be a drummer just like her Dad and perhaps to write poetry like her Mom, although she'd prefer to write songs for a future all-girl jazz band she dreams of starting one day. Selah's vacation is taken to the highest level of enjoyment after the Parkers are invited to meet a Junkanoo family by Mrs. Sawyer, a friendly room attendant at the Junkanoo Beach hotel where they are staying. The family includes an eleven-year-old goombay drummer, Papa Lou2 who with his grandfather Papa Lou Newman and his Mom, Sanmichelle, will introduce Selah and family to the delights of the Bahamas' Junkanoo culture, art, as well as the delicious Bahamian foods. Through the cultural friendship with the Newmans, Selah, Baba, and Moms Parker will meet leading artists, drummers, musicians, and performers of Junkanoo and experience for the first time the intense power of the art, music, dance, and poetry of this world famed ancestral festival. Selah had made up her mind since she was seven that she was going to be a drummer just like Baba, and while she might not be a poet like Mama, she would be a songwriter and create music for the all-girl jazz band she planned to have one day. But before she could do that, she had to get as good on the drums as Baba was. That would take lots of practice on that new drumset she�d just gotten for her birthday. "Well, we�ve got a few more days here in Nassau, so let�s see what we can do to take your mind off those drums for awhile." Moms smiled. "And to rest my poor eardrums for awhile, too!" she whispered to Baba. "Good afternoon." Mrs. Ethlyn Sawyer the maid who cleaned their room, smiled at them warmly as she passed, pushing a cart loaded with fresh towels. "You folks still enjoying your vacation?" "Oh yes, the Bahamas is gorgeous," Moms smiled back. "Mrs. Sawyer," Baba inquired, "didn�t you say you have a daughter who works with the Meet the People program?" "Yes, I sure do. She�s been working there since she got out of college in Jacksonville." "That�s great. My wife and I were thinking about connecting with the program so we could meet some Bahamians who are into the arts, but now I think we�d better try to find some youngsters in the arts that our Selah here can relate to. She wants to be a drummer like her ole man.," he added proudly. "Oh, I don�t even have to send you to Viola for that. 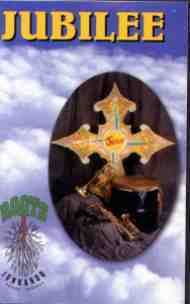 There�s a drummer family right up the road from me who�s number one in our culture. They�re top Junkanoo people." "They�ll tell you all about it, sweetie. I know they�d just love to meet you folks. I�d better get on with my work, but I�ll call them tonight. It�s real busy for Junkanoo people now, but I�ll find out if they can find a little time to meet you before you leave. " That sounds lovely, Mrs. Sawyer. We�d love that, too." Moms waved as Mrs. Sawyer walked away, humming a Bahamian spiritual. "Ya-a-ay!" Selah cheered , "finally some kids to talk to." "Delightsome," Selah winked back, skipping up the beach to continue her shell search. Two days before New Year�s the Parkers arose early to take another limo ride with Sam Marathon Man Williams--this time to meet the friendly people at his Bahamas Loving Care Association office. Then they were off to Over the Hill, Nassau�s Grant�s Town area, where they�d been invited to have breakfast and spend the day with a family of Bahamian performers, the Newmans. When they pulled up to the brightly colored, aqua and yellow house, Papa Lou Newman, opened the door to greet them. "Come on in, folks," he chuckled. "Y'all are mighty good lookin� and breakfast is a�cookin�!" The Parkers laughed heartily, feeling they had known Papa Lou for years instead of just a few seconds. "Mmm," Selah thought, "That food sure smells marvelistic." Papa Lou ushered them into the small living room and called out to his daughter and grandson who shared the home with him. A pretty young woman in shorts and a ponytail came into the room followed by her son who stared at them shyly without speaking. "Hi, I�m Sanmichelle, and this is my son, Papa Lou2. His name is Cyril, but we call him Papa Lou2 after his grandpapa here. We�re glad you could come. Say hi, Pops." "Hi," Papa Lou2 half whispered, looking down at the floor. "You folks are probably good and hungry," Grandfather Papa Lou grinned. "Come on into the dining room. San�s a great Bahamian cook, and I�m great at setting a Bahamian table. Everything�s piping hot and just a�waitin� for all those ready, willing, and able." "Just call me Mr. Ready, Nia, Ms. Willing, and Selah, little Ms. Able," Baba kidded back. "Ha, Ha!," Papa Lou whooped as he pulled out the chairs for his guests. 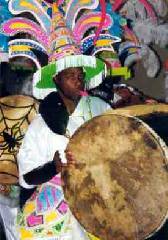 While the Junkanoo music of a famous Bahamian singer called Sweet Emily played in the background, the two families shared Bahamian and Southern folktales over the heaping bowls of grits, steaming stewed conch, platters of fried grouper, and johnycake cake, along with mugs of fresh bush tea and homemade cocoa. "So, you�re a l�il drummer girl?" Papa Lou asked Selah, as he escorted her family to the backyard to show them his collection of drums. "Yeparoni," Selah grinned, "just like my Daddy. And I�m gonna be a writer like Moms, too. She writes poems, but I�m gonna write songs." "That�s mighty nice. My l�il Papa Lou2 here don�t talk much, but he plays some powerful Goombay drums. Don�t worry �bout him being so shutmouth, though. Once he gets to know you, you want be able to hardly squeeze a word in." While Baba examined the drums at the other end of the yard and Moms returned into the house to join Sanmichelle, Selah sat in the chair Papa Lou offered her and rested her elbows on the drum in front of her. "So what�s this Junkaboo business, Papa Lou?" to entrance you and dance you as we rush by. they rhythm move and swing toward the Bahama sky. of soul-throbbin� Goombay drums, cowbells, and horns. "Oooh, I like that poem. 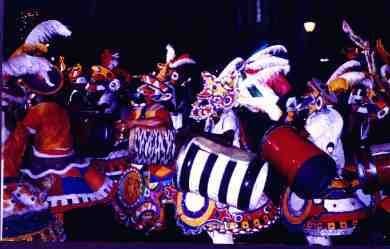 It makes me want to see Junkanoo, especially those so-o-oo-u-l-throbbin� Goombaby drums." Ha! Goombaby?! It�s goombay, l�il drummer girl. Where you get these funny words from? Let me tell you something, though, if you like soul rhythms, you gonna love Junkanoo. In fact, you wanna hear a little story?" ...and you owe it to yourself to join Selah and her family in experiencing Papa Lou's artful storytelling as well; not to mention hearing and reading Junkanoo poetry, experiencing music, viewing Junkanoo artwork, a cybertaste of an actual Junkanoo rushout by video, and actual places, faces, and spaces which can be visited during a future Junkanoo journey of your own one day. SELAH, PAPA LOU2, AND JUNKANOO ends with Selah's Photo Album, a collection of graphics of some of the leading Junkanoo personalities in Nassau and the vibrant art of Junkanoo. (Allow 3 weeks for delivery of offline orders) For all orders indicate the type of file you prefer-- download by pdf, rtf, html or disk by mail. (International destinations and Canada, add $2.50). Linda Cousins/Amasewa Okomfo, author, of SELAH, PAPA LOU2,and JUNKANOO , is the creator of the popular Junkanoo Soulsite (www.ancestraltravels.com)and an award-winning poet, storyteller, playwright, and independent publisher. at Super Bowl XXXV. Ms. Cousins' other creations for both children and adults can be found at: Cultural Traveler SoulShop Treats.